The October 10, 2016 press conference, held in Lagos, was a direct response to the Lagos State Government’s plans to demolish the typically informal structures—which Lagos State Governor, Akinwunmi Ambode described has “shanties”—around the creeks and waterfronts housing thousands of the predominantly urban poor households and fishing communities in the state. The reason advanced for demolitions was that the targeted areas have become breeding grounds for kidnappers and armed robbers, and therefore, needs to be cleared to improve security in Lagos State. The event, jointly organized by Spaces for Change, Community Life Project and Centre for Children’s Health Education, Orientation and Protection (CEE-HOPE), was aired on TVContinental and Silverbird Television during the 9.00PM and 10.00 PM national news on the same day. The press conference brought to the fore, the plight of Lagos communities, displaced by recurrent forced evictions and demolitions of their homes and businesses at the behest of the Lagos State Government. The event brought together leaders and representatives of evicted communities from different parts of Lagos State and a diversity of print and electronic media practitioners and organizations–including Premium Times, TV Continental, Silverbird Television and the Niche newspaper. The Lagos State government has had a long history of making excuses for demolishing the homes of the poor, and the lands taken are converted into affluent neighborhoods. Crime fighting, in particular, is one of the most-popular excuses, and demolitions executed under that banner show a pattern of discrimination against poor communities. The areas described as “shanties” are in fact, people’s homes, schools and businesses. Most government-owned and private property developments are traditionally unaffordable to the middle-income groups, let alone to those at the lower-income cadre. Giving the residents of these communities only 7 days’ notice smacks off executive insensitivity as this would clearly put them in great hardship, pushing them deeper into poverty. Building low-cost housing and guaranteeing security of tenure will encourage slum dwellers to improve their structures. Demolishing the houses of the urban poor is not the best way to curb the housing deficit in the state which current estimates placed at about 2.5 million. Demolition neither reduces nor eliminates slum growth, because evictees often regroup and move elsewhere, as a result of poverty, to create another slum settlement. Nigeria is signatory to various international protocol and convention which requires she does all within her power to provide decent and affordable housing to Nigerians. According to Betty Abbah of CEE-HOPE, shelter is a basic right and that the action of the Lagos State government amounts to criminalizing people for being poor. Nothing exemplifies the characteristic criminalization of urban poverty more than the recent plans to displace tens of thousands because of the recent incidents of kidnapping and armed robbery in the state. No single resident of the targeted creeks and waterfront communities has either been arrested or found to be connected to these incidents. But yet, the entire area where they live has been negatively profiled to pave way for forced evictions and demolitions. The country has enormous resources at its disposal to provide decent and affordable accommodation for all, but this has not been possible as a result of the mismanagement of resources by the political ruling class. As a signatory to the Habitat Agenda and a host of other international commitments that obligate governments to protect the right to housing, the government of Lagos State must ensure it works within the ambit of the law, eschewing all forms of arbitrariness in its action towards slum dwellers. The use of force or knee-jerk response to urban problems has always backfired. The Boko Haram uprising in the north of country is a classic example. In a passionate plea, Ms. Abah urged the government to consider the plight of poor Lagosians, who reside in these areas, taking into account, the worst economic recession currently being witnessed in Nigeria. She urged the government to pursue an inclusive agenda in its implementation of its mega-city project; and engage the people in developmental projects that may be beneficial to them. Governance should always have a human face, Ms. Abah insisted. Community Life Project’s Chinedu Eze noted that the Lagos State government’s plan to demolish homes around the waterfronts is the height of executive impunity. The poor are only considered during election periods, and later on, marginalized and excluded from governance. There are various ways of fighting crimes, but dislodging the entire populace from a place they have called home for many years is not the most effective method. What about exploring community policing, which involves working with the head of the various communities to identify and report potential criminal elements? Journalists at the event took turns to seek clarifications regarding the position of the civil society groups vis-à-vis the government’s demolition policy. 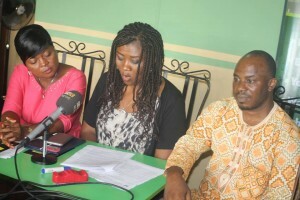 Ms. Helene Oyibo, a reporter from SilverBird Television informed that the Lagos State Commissioner of Environment has hinted of the state government’s plans to compensate affected residents. She wanted to know whether demolitions carried out after the payment of compensation would still be regarded as violation of human rights. Victoria Ohaeri redirected the question to the representatives of the different evicted communities to disclose whether they have been compensated for previous demolitions. In unison, they chorused a resounding NO! Victoria Ohaeri reiterated that the planned demolition is just an excuse to displace the urban poor from their settlements and hand over the recovered land to the rich as was done to Pura community where the Eko Atlantic City project is now sited. Same thing happened in Maroko in July 1990 which is now the present day Lekki Peninsula, littered with sprawling estates for the super-rich. The Favellas in Brazil, Mrs. Ohaeri said, is a rich example of how the government can turn around the slums by prescribing a building code and granting residents security of tenure. This will generally improve living conditions in some of these communities labelled as slums. Ishaya Ibrahim from the Niche Newspaper wanted to know whether the demolition plan would only target squatters and illegal occupiers of land. In response, CEE-HOPE’s Betty Aba reminded that in a situation where the state cannot provide homes for everyone, the government can come to a compromise by upgrading slum areas and legalizing land ownership for residents. Victoria Ohaeri added that not all the dwellers or victims of demolition are occupying the property illegally. There are some whose ancestry are tied to some of the land in question but the government hardly takes time to sort out and settle all the facts regarding ownership, before rolling in their bulldozers. It would be wrong to call all victims of government demolition exercises, illegal occupants. Pastor Olatunde Aworetan, a resident of Badia community that was demolished in September 2015, pursuant to a wrongly-executed court judgment recounted the experiences displaced Badia residents. He painted a graphic picture of how the place they have called home for almost forty five years was reduced to rubbles, deepening the suffering of former residents. He questioned the sincerity of the government in taking over their dwelling places, and after a short time, housing units are springing up from the same space they were evicted from. The state government’s promise to carry the people along in the ownership of the new housing units is yet to be seen, he stated. Chief Adu Edeha of Aitikporome community, in Badagry, Lagos who also doubles as the community leader recounted how they were displaced from their land by the police in concert with the Lagos State government. The Lagos State government donated a parcel of land to the Nigerian Police for the development of a co-operative society. The markings and land delineation on the survey plan clearly shows that the land given to the Police is apparently different from the areas the police authorities forcefully took over, and demolished the buildings on them to pave way for a private housing construction for police officers. A court restraining order against the police’s unlawful actions did not deter them from continuing with the project. Worse still, there is a growing feeling among the displaced community residents that the Lagos High Court has not treated them fairly in its rulings. An adhoc committee set up by the Lagos State government to look into the complaints of the community has visited the site. Till date, they have refused to publicly disclose their findings. “We, the affected residents are willing to go to great length to see that we get justice, even if it means pursuing this claim up to the Supreme Court,” he emphasized. Mr. Paul Olaitan from Purah community stated that before their community was demolished, they were not given even a day’s notice. He said the Lagos State officials just invaded their community with police and set their houses ablaze. He claimed to have lived in the community for almost 65 years. Ishola Agbodemu of Rural and Urban Development Initiative (RUDI) stated that being at the press conference gave him mixed feelings. He pointed out the hypocrisy of our political leaders who are ever willing to befriend slum dwellers during election period but to turn against them when they feel they are no longer relevant. He thinks the term, “illegal occupants” used to describe slum residents was offensive because the obligation to provide housing for citizens rests on the government. If Nigeria is party to the relevant UN Conventions on shelter, why is the government not honoring its obligation to the people?, he queried. In closing, there was consensus that crime is not a location-specific activity. There are better ways of improving security in slum communities other than through demolitions. Demolition exercises are destructive to the overall wellbeing of poor residents, with a disproportionate impact on women and children. For instance, a woman spontaneously gave birth to triplets during a demolition exercise in Makoko. The triplets died in quick succession soon after birth and their mother ran mad. She remains homeless till date, and in a poor mental state. The pattern of demolitions across the state also smacks of discrimination. Houses in rich neighbourhoods are never pulled down because of armed robbery and criminality, but only the poor are targeted for the same reason. Rental costs in the Lekki corridor are so unaffordable that apartments have remained empty and unoccupied for several years. In the same manner, local markets across the state—like Oshodi and Tejuosho markets—that were demolished and replaced with very expensive ultra-modern shopping malls have also remained vacant several years after construction because the costs are beyond the reach of the displaced petty traders. Attendees were unanimous in their call on the Lagos State government to rescind its decision to demolish waterfront communities in the interest of justice and fair play.